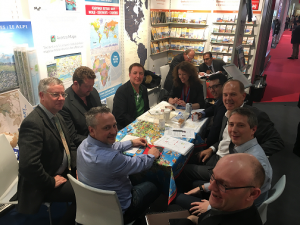 Once again, the International Map Industry Association is showcasing its members at the upcoming Frankfurt Bookfair this fall. The Frankfurt Bookfair, which runs from Wednesday, Oct. 16 to Sunday, Oct 20., is the world’s leading venue for printed and digital content. During this massive event, publishing experts meet up with partners from the technology and creative industries to exchange ideas, be inspired, try out new technologies and cultivate contacts. IMIA is offering members the opportunity to share exhibit space for an affordable price. The benefits of the joining the collective stand include: a professional appearance and greater visibility, a comfortable and productive work setting, great networking, professionally manned stand throughout the fair, booth set up and tear down facilities and an evening reception for networking opportunities. The IMIA collective stand offers a great opportunity to be part of this widely attended event. 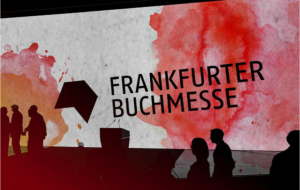 In 2018, the Frankfurt Bookfair had more than 285,000 visitors from 164 countries— 116,000 general public visitors and 169,000 trade visitors. Last year, there were more than 7500 exhibitors from 109 counties providing an international hub for the publishing industry. Last year, Benchmark Maps joined IMIA’s collective booth after hearing about its success from association colleagues. The experience met the high expectations they had set, according to Bridger DeVille, Sales & Marketing Director for Benchmark Maps. If you are interested in exhibiting at the IMIA collective stand at the Frankfurt Bookfair, please contact Hans Niemeyer of INTERKART at shop@interkart.de.